Tip – this recipe is nice with roasted cherry tomatoes. Place the potatoes in a large pan of boiling water. Boil for 6 minutes then drain. Meanwhile heat 1 tbsp. oil in a large non-stick frying pan over medium heat and fry the onion and garlic for 5 minutes until soft. Increase the heat to high and add the beef mince. Fry for 5 minutes until beginning to brown. Remove from the pan and set aside. Heat the remaining oil and the cubed potatoes, tomatoes and rosemary for 5 minutes until beginning to color. 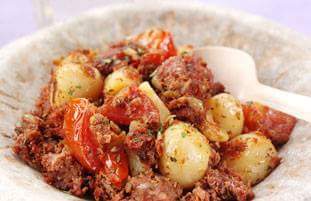 Return the beef mince, season and cook for a further 5 minutes.